Surprise and delight a crowd of any type with this gourmet mozzarella stick recipe! Thaw one roll of Phyllo, following thawing instructions on package. Preheat oven to 450°F. Unroll and cover the sheets with a damp towel or plastic wrap to prevent drying out. Place one sheet of Phyllo on work surface. Lightly coat ½ of the sheet with cooking spray widthwise. Fold sheet in half widthwise and spray top layer. Place 1 cheese stick 2 inches from the short end of the strip. Top with 1 teaspoon of marinara sauce. 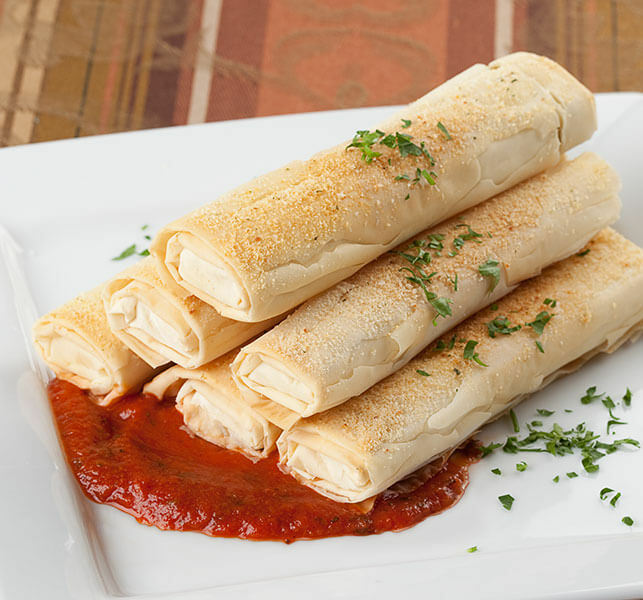 Loosely fold long edges over cheese and marinara. Then fold short edge over and roll to the end of the strip. Repeat to make 12 Phyllo sticks. Reroll unused sheets and follow storing instructions on package. Place on a baking tray seam side down. Lightly spray the outside. Sprinkle with bread crumb mixture. Bake for 7 minutes, or until Phyllo is golden brown. Serve warm. MAKE AHEAD: May prepare ahead, wrap in plastic and freeze. To serve, unwrap and bake per directions. 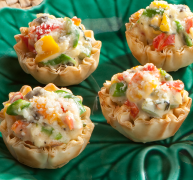 VARIATIONS: Can also be made in Athens® Mini Phyllo Shells.